Has anyone retro fitted a tailgate spoiler? Just wondering how you attached it? The spoiler has 2 removable threaded locating pins on the feet but I’ve considered just bonding it on with tiger seal so I don’t have to drill any holes. The foot on each side has quite a large contact area so I think it would be ok. If you’ve had one off before what do the pins press into on the tailgate? I’m guessing some sort of plastic cup but my googling has came up blank. Replied by Daniel30 on topic Has anyone retro fitted a tailgate spoiler? This chap did but no mention of how, think he sold his jimny but might still answer a pm. Replied by helijohn on topic Has anyone retro fitted a tailgate spoiler? NineCherries wrote: Just wondering how you attached it? Not that it helps much but my Junior's spoiler is bolted from above. Last edit: 16 May 2018 18:52 by helijohn. Replied by Darthblaker7474 on topic Has anyone retro fitted a tailgate spoiler? Was straight forward enough, get your spoiler and put something "creamy" on the bolt holes underneath, I used Polish. Next place the spoiler on the tailgate carefully and then lift it off, the polish leaves two marks that you can drill into. Drill a hole large enough to get the thread of the bolt through on the outside of the tailgate, then on the inside drill a hole that is large enough to get a socket into (10mm I used). To fill in the hole on the inside I used two grommets to neaten things up, once I've gotten mine resprayed I'll probably tigerseal around it too. Superb job; I like the pics too as it all helps. Replied by Bosanek on topic Has anyone retro fitted a tailgate spoiler? So did you just use two screws and no glue or some padding between the spoiler and the rear door? I bought a new (primed, unpainted) aftermarket Polish-made spoiler from Ebay. It is not an original Suzuki accessory but a copy. It is tailor made for Jimnys. I has two threaded holes in the feet (one hole per foot) and comes with two screws. However, when I position the spoiler on the top of the rear door, it does not fit perfectly. 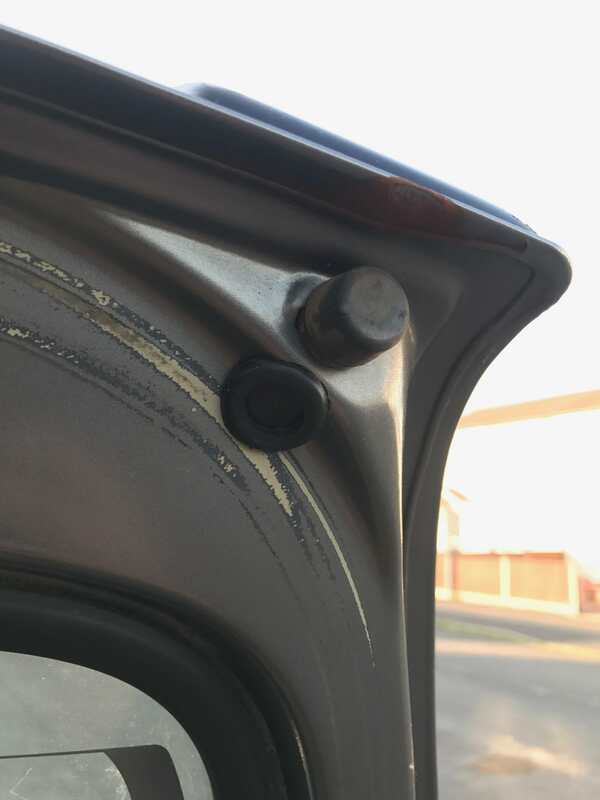 The curvature of the spoiler's feet is not perfectly molded according to the shape of the upper curvature of the rear door - there are slight gaps in between when I position the spoiler against the door. 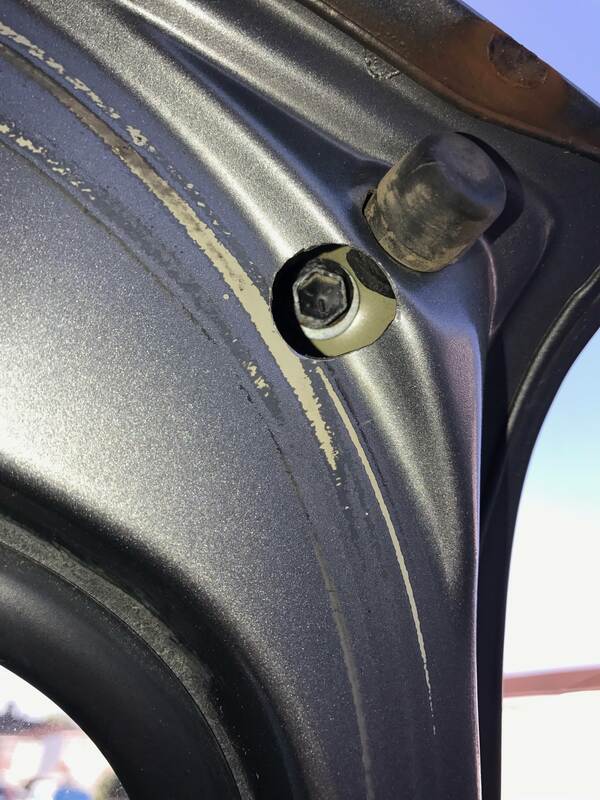 The seller did mention in the item description that some sanding or filling of the spoiler for adjustment might be needed. So they insured themselves against these kind of complaints. I would like to know if Suzuki's original rear door spoiler fits perfectly on the upper curvature of the rear door or not? And what would you suggest that I do in order to make if a perfect fit? Did anyone else buy those Polish spoilers on Ebay? Replied by Keithy on topic Has anyone retro fitted a tailgate spoiler? Same one I fitted to mine....a copy of the original.....it fitted like a sock on a hens head. I just sanded it to fit and glued it on....I used Sikaflex Acrylic...drilled the holes where the studding went but didn't fancy the holes in the inner panel. Just been and had a look.....time to re-glue....maybe the holes can be tolerated lol. Replied by NineCherries on topic Has anyone retro fitted a tailgate spoiler? The spoiler I got was a 2nd hand Suzuki original. It fitted well and followed the curve of the tailgate. Last edit: 12 Sep 2018 22:22 by NineCherries.